I like the framing very much - I think I'd have preferred a shot of the lower storey to add to the effect, especially as the strip of sky at the top is a bit distracting. 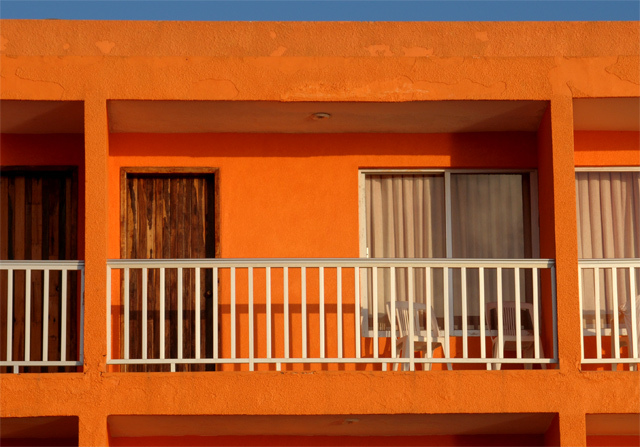 Great color, too bad someone wasn't doing something on that chair or over that balcony or peeking from a window. Interesting subject with good contrast. I might like it better if it was shot at a different angle, instead of straight-on. Solid lines, really bland subject made more interesting by the crop and abstract nature of the photo. 6. Great use of the colour theme in the challenge. The shot itself doesn't have much interesting going though. Nice photo. Not sure the "wow" factor is present. Sky should be bigger or just cropped away. Proudly hosted by Sargasso Networks. Current Server Time: 04/23/2019 11:53:41 AM EDT.